For the third EP, this year, we choose one of our best visionary artists, Libe. Working for a long time with him we came up with the best tracks to suit our needs and hopefully your taste. These three originals by Libe are heavy baseline driven tracks to show an attitude in your sets and to set you free while enjoying the dance and rhythms on them. Having made lots of edits and working with old samples Libe is making his own style into the sound of tomorrow which he calls Future Break. Future Break track is remix by our beloved brother Guy From Downstairs, where he adds his own signature and house rhythm. Enjoy the future break sound of tomorrow, from Tzinah with Love! 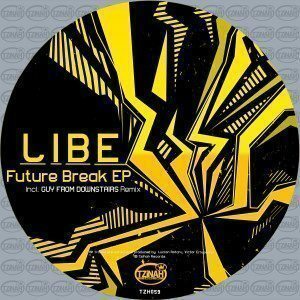 Libe - Future Break EP [TZH059] incl Guy From Downstairs Remix is supported by Richie Hawtin, Marco Carola, Danny Tenaglia, Paco Osuna, Cesar Merveille, Gel Abril, Julie Marghilano, Grego G, Archie Hamilton, Negru, Jorge Savoretti, Giovanni Verrina, Joseph Capriati, Nina Soul, Alex Piccini, Varoslav, Psykoloco, Powlson, Bunte Bummler, Javi Bora, David Gtronic, Horatio, Jessica Diaz, Double Dash, Deltano, Oshana, Cesar Sanchez, Patrice Meiner, Cristian Varela, Nino Santos, Jay West, Super Lounge, Seb Zito, Re-UP, Lightem, Luc Ringeisen and many more! Thank you! Gel Abril: all sounds good will play tnx! Julie Marghilano: Lib Hac and GFD future break are my favs here! thanks! Javier Carballo: Hac Original and future break remix are geat! thanks for the music. Jorge Savoretti: the remix is my winner here! Giovanni Verrina: nice one thanks! Nina Soul: Very nice tracks Libe, Future Breck for me!! Varoslav: Libe has the groove..this one is good again .SUPPORT ! Double Dash: Future Break + Remix for us. Thank u for the music. Nino Santos: Full support for Olsa !! Good job ! Lightem (Genial,Brise): Amazing release! Future Break straight to my bag! Jozhy K: Great EP with beauty remix from GFD! Support! Alessio Collina: Guy from downstairs!! such a tune! Adam Touch: Great EP, pure raw sounds here, like the originals and the remix too! Thanks for sending! Giacomo Greppi: For me Guy From Downstairs Rmx !! ... Really nice vibes !! ... Thx For the Music !!! Edground: My favourite is Olsa. Very nice. Dimitri Monev: Future Break both versions are my top here, support !! Primarie: Looovely tunes! full support for this great artist! Scott Rozario: Guy From Downstairs remix!! M-Phunk: Nice tracks, GFD remix the best! Guy From Downstairs: LIBE ma man!!!!!!! DEAF PILLOW (Rodrigo Lozano): Guy From Downstairs for us !! Alex Kravitz: NICE, GFD rmx for me, THX! Olivian Nour: Future Break and Hac for me. Cool release. Thanks! Andu Simion: Nice release! "Future Break" Original &amp; GFD Remix for me. Thanks! Deaf Pillow: All tracks are great here, loving 'Hac'. Maertz: Really nice music again, Guy From Downstairs Remix and Osla (Original Mix) are my picks of the EP. Thanks so much for sending, I will play for sure. Big support!!! Claudia Amprimo: thanks for the music!! Boronas/SquareRoomHeroes: great pack again.!! will try it next days for sure.! Vygo: Future break it is!! Bvoice: Guy from Downstairs is good for the pijama areas! In love. Ciao &amp; hug! Scan Mode: wowww nice one! My support! Bolumar (Amam/Rooted): This ep is so nice! Future break (Guy from downstairs remix) is my favourite will Play for sure, thanks for sharing! Hess: Solid EP all round! Really digging Olsa. Herck: Huge. Full support for libe ! Thank you for the music ! Gik: Thank you for the music, `Future Break` original and remix sound realy nice .Nice EP ! Saboar: Brings back old memories! Full support! :) Guy From Downstairs included in my next set! Thanks! Velasco: Loving the entire hip hop feel on this release...full support from the planet of Brooklyn! Clara Da Costa: Great Ep. Will be supporting this on Jacks House, Ibiza Sonica Radio. Flmb: GFD remix for us! motoko: Solid, full support. Really digging the direction Tzinah is heading. Guy From Downstair's remix is fave. Dejvid: Quality stuff from Tzinah, as always :) My fav Hac - or. Mix! Scopter: Good work, I will play this. P.S. : Hac is my favourite. Katoline: Nice tracks! Hac my favourite ! Thanks Tzinah.